Dual wall and Ceiling installation design. Easy Installation.Tensioned flat surface for a perfectly smooth projection surface. Highly quiet tubular motor with up/down/stop buttons and easy to adjust electric projector screen stop limits. Unique Wire Tension Technology Eliminates any Bumps and Waves from the Surface. 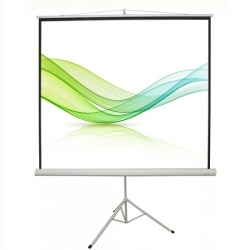 Front Projection Screen surface has black-backing to avoid light penetration. Rear Projection PVC material has a special surface coating that enhances color reproduction and black and white contrast for an amazing viewing experience. Tab-Tension series extremely efficient and easy to use, Featuring a silent electric motor and remote-controlled operation. The durable casing easily installs to your wall or ceiling with the included install kit. Ships fully assembled, plug and play ready. Electric Tab-tension Screen is designed to prevent wrinkles, curling, and creases, Perfectly suitable for an impressive prefessional environments or home theater presentation. Fine Real PVC Material With 1.1 Gain. 4K Ultra HD and Active 3D Projection Ready. 160 degree wide viewing angle that is perfect for home or commercial use. High contrast 1.1 gain screen material, 4K Ultra HD, 2D and 3D Projection Ready. Flexible PVC material that has exquisite vein,good tensile strength and without any deformation. Black masking borders to enhance picture contrast, Black backed screen can eliminates light penetration. Soft PVC screen surface is Mildew resistant and washable with mild soap and water. Quality PVC Screen Material provides the widest possible viewer angles with perfect diffusion uniformity, image color reproduction and black & white contrast. High Quality Screen Material, Multi-layer weave, Wide viewing angle. Mildew resistant, and easy to clean with soap and water. Tab-Tension Electric Screens arrives plug and play ready and comes bundled with accessories for total user control. The fully tensioned screens are viewed as the hightest performing screens, maximizing resolution and light reflectivity. Tensioned Projector Screens is an electric projection screen that embodies all the virtues of quality, durability, and aesthetic value. Screen Material: Front projection fabric,Rear Projection film,Acoustical Transparent material, 3D metal material etc. A: Our factory supply ability is 5000 pieces per month.